Home » Beginner Tutorials » Does Swiping Speed Matter? In my last project, I swiped with gold over a magenta pink and black with some really stunning results. 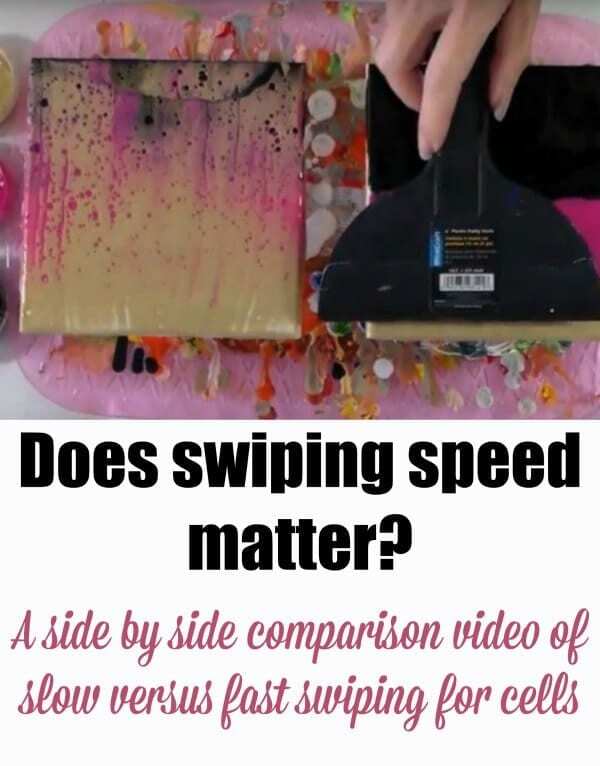 Then I got to wondering…does swipe speed matter? If I swipe slowly, I can have more control for sure. But if I swiped quickly, would the paint ‘move’ more and give it more of an opportunity to create more cells or bigger cells. There was only one way to find out – with a side by side test. I also go on to try swiping with a clear sheet protector – hmm, that was a mistake. I felt so old looking for acetate sheets here on the island. All the ‘youngsters’ had no idea what an overhead projector was, or the acetate sheets I needed. Those were the days before PowerPoint and slideshows you play on your computer. Who remembers doing an OHP presentation where you wrote or drew on the acetate sheets – I do. Check out my swiping experiment below. No finished pictures for this one, because my results weren’t worth keeping today. But I did learn some interesting and important lessons to improve my painting. Better luck with the next experiment! The modern equivalent of the overhead projector film is laser or ink-jet transparency sheets that are coated with something that allows printing. Dura-lar film can be painted on, and it might be interesting to do a pour on it! It’s available on Amazon.